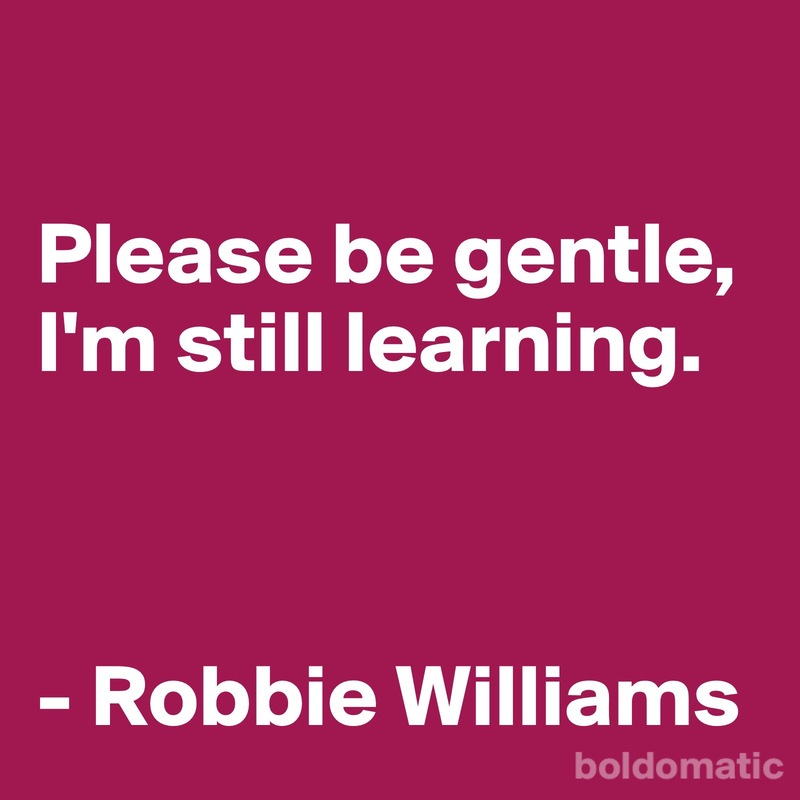 “Please be gentle, I’m still learning” Robbie Williams sings in the song Advertising Space. Imagine living approximately forty years before getting that. Forty years before understanding that if I’m not gentle with myself, much less learning takes place. If I associate learning with pain, with being chastised, told off, “I should have known”:ed, do you think my system would be promoting and encouraging learning? No. It (I) will run the other way. Shut down, slowly, insights will be fewer and farther apart… or at least, they will be significantly more quiet, almost unaudible. The inner voice of wisdom, of universal mind, will be barricaded, by myself, by my self-preserving ego. The inner voice will be unwanted. Out of fear. Fear of the pain that comes with learning, which I’ve associated with pain and harshness. And that will only change once I begin to be gentle with myself. And I speak from personal experience when I say that being gentle with me, is a very strange and unfamiliar concept for one accustomed to being harsh. Realizing my internal harshness was one of the greatest aha-moments of my life, and what I saw was that it’s not mandatory to be my own harshest judge. Kindness, gentleness, is an option. Also for me. This insight has been with me since 2006 or 2007, and took place during a therapy session. Since then I’ve practiced being gentle with myself, och it’s something which comes more and more natural to me nowadays. And that’s me reverting back to being more fully me, because I think it is our natural state. We’re born and created to be gentle with ourselves, otherwise we wouldn’t be the learning creatures that we are, from the very get go. Imagine a small child being harsh with herself for not immediately knowing how to walk, run, ride a bicycle. A child is naturally gentle with themselves, trying, failing, falling down, trying again, failing, falling down, trying again…. over and over until suddenly, one step is managed, then two, then all of a sudden, the child can walk, can run, can ride a bike. What happens to us? Why do we – or at least I – stop being gentle with ourselves, and rather start to be hard on ourselves? Is that why children are the greatest learners there is? Not because adults don’t have the capacity to learn, but because we’ve stopped being gentle with ourselves, we expect to get things right away, and we are afraid to try and fail. Because we’ve put another meaning on what it means to fail, than the child trying to learn how to walk, run, rida a bike. We believe it means we are bad, not good enough. While the child simply knows it means that the learning process is still unfolding, there’s more to learn, more to master, before the learning process has manifested into yet another skill. And somehow, adults impose their faulty understanding upon children, creating yet another harsh un-learner. What if we adults instead would learn from children what it is we are born to be? Life long learners, where the only prerequisite is being gentle to ourselves. Please be gentle, I’m still learning. Are you?